Defining a hydrogen bond in the year 2011? That was odd to say the least. Hydrogen bonds have been known for at least seventy years now. It was in the 1940s that Linus Pauling defined them as foundational elements of protein structure; the glue that holds molecules including life-giving biological molecules like proteins and DNA together. Water molecules form hydrogen bonds with each other, and this feature accounts for water's unique properties. Whether it's sculpting the shape and form of DNA, governing the properties of materials or orchestrating the delicate dance of biochemistry performed by enzymes, these interactions are essential. Simply put, without hydrogen bonds, life would be impossible. No wonder that they have been extensively studied in hundreds of thousands of molecular structures since Pauling highlighted them in the 1940s. Today no chemistry textbook would be considered legitimate without a section on hydrogen bonding. The concept of a hydrogen bond has become as familiar and important to a chemist as the concept of an electromagnetic wave or pressure is to a physicist. It turns out that behind the story of defining hydrogen bonds lies a paradigm that takes us into the very guts of the nature and philosophy of chemistry. It leads us to ask what a chemical bond is in the first place; drill down deep enough into it, and it starts appearing like one of those existential questions a Zen monk would ask about life or the soul. Remarkably enough, in spite of the debate and redefinitions, the basic features of a hydrogen bond are not controversial. A hydrogen bond is a bond that exists between a hydrogen and two other non-hydrogen atoms. Those two other atoms are most commonly oxygen and nitrogen, but that's where the consensus seems to end and the endless debate begins. The basic reason for the debate has to do with the very definition of a bond as laid out by pioneering chemists like Gilbert Newton Lewis, Irving Langmuir and Linus Pauling in the 1920s. Loosely speaking a bond is a force of attraction between two atoms. It was Lewis who made the groundbreaking suggestion that a chemical bond results from the donation, acceptance or sharing of electrons. Pauling codified this definition into a rigorous principle using the laws of quantum mechanics. He showed that using quantum mechanics, you could prove that the sharing of electrons between two atoms leads to a net lowering of energy between them: this sounds logical since if there were no lowering of energy, there would be no incentive for two atoms to come close to each other. So far so good. Everyone accepts this basic fact about chemical bonds. Treatises have been written about the various bonds between different atoms seen in a bewildering array of metallic, organic and inorganic molecules; Pauling's seminal book, "The Nature of the Chemical Bond", described such interactions in loving detail. In this book he showed that bonds can be covalent or ionic; the former involve a symmetric sharing of electrons while the latter involve an asymmetric give and take. There are also many intermediate cases. Furthermore, whether a bond is ionic or covalent depends on the electronegativity of the atoms involved. Electronegativity is the innate property of an atom to hold on closely to its electrons. Fluorine for instance is the most electronegative element of all, holding on to its electrons in a fiery embrace. Metals on the other hand are happy to give away their electrons. Not surprisingly, bonds between metals and fluorine are readily formed. It is in the context of electronegativity that it's easy to understand hydrogen bonds. A hydrogen atom, just like a metal, is happy to give away its lone electron and form a positive ion. Oxygen and nitrogen atoms are happy to accept this electron. Thus, a hydrogen bond forms when a hydrogen atom is shared between two oxygen atoms (or one oxygen and one nitrogen, or two nitrogens). 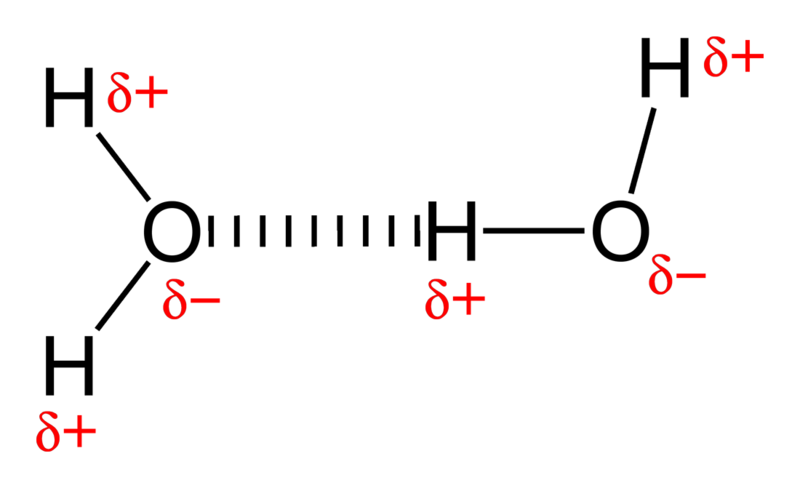 Because of the difference in electronegativity, the hydrogen acquires a slightly positive partial charge, and the other atoms acquire a slightly negative partial charge (represented in the picture above). Think of two oxygen atoms with a hydrogen between them acting as a bridge: that's a hydrogen bond between them. Because a hydrogen atom is small and has only a single electron it can achieve the feat of forming this bridge; what is fascinating is that this is partly the result of a unique quantum mechanical phenomenon called the tunnel effect. All this is rather uncontroversial. The debate starts when we ask what criteria we use to actually identify such hydrogen bonds. Chemists usually identify bonds by looking at experimental structures of molecules. The most common method of acquiring these structures is by x-ray diffraction. Bouncing x-rays off a crystallized molecule allows us to accomplish the molecular equivalent of taking a photograph. The molecules under question can be anything from common salt to complicated proteins. These structures form a cornerstone of chemistry, and they are not just of academic importance but have also been immensely useful in the design of new drugs and materials. When chemists acquire the crystal structure of a molecule, they will usually do something very simple: they will measure the distance between various atoms. The hallmark of a chemical bond is a short distance between two atoms; think of it as two people embracing each other and reducing the distance between themselves. How short, exactly? Short enough to be less than the sum of Van der Waals radii of the two atoms. Imagine the Van der Waals radius of an atom as a kind of safe perimeter which an atom uses to hold other atoms at bay. Each atom has a unique Van der Waals radius defining its safe perimeter which is measured in the unit angstroms (1 Å = 10-10 meters). Hydrogen for instance has a radius of 1.2 Å, nitrogen has a radius of 1.5 Å. If a chemist measures the distance between a hydrogen and nitrogen in a crystal structure as being less than 2.7 Å (1.2 + 1.5), she would usually declare that there's a bond between the two atoms. If the three atoms in a hydrogen bond satisfy this geometric criteria, then one could legitimately claim a bond between them. But this simple procedure turns out to be far trickier to accept than we can imagine. Here's the problem: a crystallized molecule is a complex assembly of hundreds or even thousands of atoms, all of which are jostling for space. The eventual formation of the crystal is not a zero-sum game; some atoms have to give way so that others can be happy. As the pioneering chemist Jack Dunitz has succinctly noted, "Atoms have to go somewhere". Thus, some atoms are simply forced together against their will, just like people in a cramped train compartment who are forced together against their will. Now, just like those cramped people, the distance between two such cramped atoms will be unnaturally short, often shorter than the the sum of their Van der Waals radii. The key term here is "unnaturally": the distance is short not because the atoms actually want to be close, but because they are forced to be so. Can one then say that there is a bond between them? And how short does this distance need to be in order to be called a bond? There's another conundrum that emerged as thousands of crystal structures of molecules started to appear during the last few decades. While the "classical" hydrogen atoms bridging oxygens and nitrogens were well known, short distances also started appearing between hydrogen and atoms like carbon and chlorine. The purported hydrogen bond zoo started to get populated with even more exotic creatures. For instance chemists started noticing close contacts between hydrogens and the flat face of benzene rings: these hydrogens are attracted to the ghostly electron clouds lying on top of the rings. Sometimes you did not even need a benzene ring; two doubly bonded carbon atoms would appear as magnets for hydrogens and pull them close. And these hydrogens in turn again would not just be bonded to oxygens or nitrogens as their second partners; they could be bonded to carbons, or even to metallic elements. Experimental observation forced the concept of hydrogen bonds to be extended not just to other bonafide atoms but to more abstract entities like clouds of electrons. Two overriding questions thus emerged from these decades-long exercise of observation and analysis: Can one claim a bond between two atoms in a molecule - specifically a hydrogen bond in case of hydrogen, oxygen or nitrogen - simply based on the distance between them? And what atoms exactly constitute a hydrogen bond? The IUPAC committee in 2011 seems to have exorcised both demons with a single stroke. They defined a hydrogen bond as any kind of bond between a hydrogen and two other atoms, provided that the other two atoms are more electronegative than hydrogen itself. That always included oxygen and nitrogen, but now the definition was expanded to include carbon and halogens (chlorine, fluorine, bromine and iodine) as well as ghostly entities like electron clouds on top of benzene rings. As far as the distance criterion was concerned, IUPAC made a wise decision in allowing it to be fairly variable and not simply limited to a hard cutoff within the sum of Van der Waals radii. The IUPAC decision illuminates three very important aspects of chemistry. Firstly, it tells us that many chemical concepts are fuzzy and only approximately defined. For instance, although we have defined the distance between the hydrogen and other two atoms in a hydrogen bond as being less than the sum of their Van der Waals radii, in reality these distances are best derived as a statistical distribution. Some hydrogen bonds are very short, some are very long, and most are in the middle: even this classification has been a hotbed of contention, and you will find arguments about the nature and energies of "short" and "weak" hydrogen bonds in the scientific literature that approach the vigor of gladiatorial contests. The ones that are short usually involve nitrogen and oxygen, while the long ones involve the elements included in the expansive IUPAC definition. This fuzzy reality extends to other concepts in chemistry such as aromaticity, polarizability and acid and base behavior. Unlike concepts in physics like wavelength and electrical conductivity, concepts in chemistry can be much more malleable. However this malleability is not a bug but a feature, since it allows you to capture a vast amount of chemical diversity in a central idea. The second key aspect of chemistry that the IUPAC statement reveals is the fact that scientific concepts don't have to always be rigorously defined in order to be useful. The definition of a hydrogen bond goes to the heart of chemistry as a science based on models. A hydrogen bond is a bond, but it's really a model based on our ideas of the myriad ways in which molecules interact. The key feature of a model is utility, not reality. In my own work for instance, I can recognize and exploit hydrogen bonds between proteins and drugs and improve their directionality and strength, all without worrying one bit about their precise, rigorous definition. Similarly polymer chemists can create new forms of hydrogen-bonded plastics with novel functions without caring much whether their hydrogen bonds conform to some well-defined ideal. Whatever the debate about hydrogen bonds may be, my view of them is similar to Potter Stewart's: I know them when I see them. Or, if I wanted to offer a cheesy but still quotable line from one of "The Matrix" movies, a hydrogen bond is merely a phrase; what matters is the connection it implies. Ultimately, this fuzzy yet useful view of hydrogen bonding makes an important statement about the philosophy of chemistry. It tells us that chemistry has its own philosophy based on models and utility that is independent of its roots in physics. 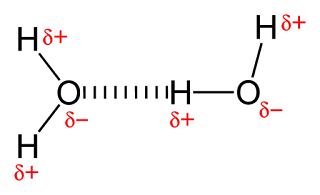 As the chemist Roald Hoffmann memorably put it, chemical concepts like aromaticity and electronegativity start to "wilt at their edges" when examined too closely, and Hoffmann could have been talking about the hydrogen bond there. The physics-based view of a hydrogen bond would involve writing down the Schrodinger equation for these bonds and rigorously solving it to obtain quantities like the energy and geometry of the bond. But that exercise is too reductionist; it does not actually help me understand the nature and variety of these bonds. It won't tell me why water is liquid and why it flows from mountains, why it's a universal solvent and why it's an existential life-giver. Chemistry proclaims its own emergent language and philosophy, and while the material entities of which molecules are composed are grounded in physics, the molecules themselves belong squarely in the domain of chemistry. The fact that chemists are still debating hydrogen bonds means that chemistry remains an exciting and vibrant discipline, one in which even basic concepts are still being sculpted and fine-tuned. It tells us that for the foreseeable future chemistry will continue to be a science without limits, a country with open borders. The hydrogen bond should give chemists an opportunity to celebrate the very soul of their work.